Slightly more than half a billion quarters honoring the 31st state of the Union, California, were coined in just 10 weeks before the Mint moved on to the 32nd state, Minnesota. 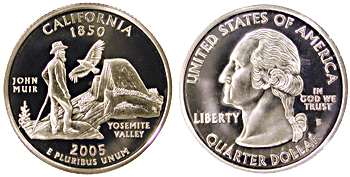 tarting in 1999 with the release of five new quarters with a state design on the reverse, the U.S. Mint has taken on the longest commemorative program in its history. The initial plan was to issue five quarters per year, in the order of each state's joining the Union. Delaware was first. Collectors immediately started scouring new bank-wrapped rolls for the new issues. Making the collection complete, however, takes more than just searching through bank-wrapped rolls and loose change. For each year, five new designs are issued  five with a "D" mint mark (from the Denver mint) and the same five designs with a "P" mint mark (from the Philadelphia mint). In addition, two matching designs are issued each year from the San Francisco mint with an "S" mint mark. One of these is a "proof" issue in the regular, copper-nickel clad composition; and a special proof issue in silver. These "S" mint coins are available only by subscription from the U.S. Mint, so they would most likely never be found in circulation. Also, the number of "S" mint coins is far smaller than the regular "P" and "D" mint issues. Thus, for a complete collection (due by 2010), there would be 220 coins. After the program began, it was announced that in addition to the 50 states, five more territories would be added: District of Columbia, Puerto Rico, Guam, U.S. Virgin Islands and American Samoa. So far, the annual mintage figures for each issue run about 250 million to 400 million coins, and for the proof issues, 1 million in clad and about 800,000 for the silver proofs. The proof coins are sold in sets of five. How valuable the complete set would be is uncertain; it depends heavily on the collector demand for complete sets and on the ability to find choice uncirculated and proof coins for each date and mint mark. Thus far, all P- and D-mint mark coins can be found in circulation, and even in mint condition are worth barely more than face value. By 2010, conditions may change; we'll just have to wait an see. For children, a complete set of 55 types would be an inexpensive challenge  and educational, as well.